Slate gray sky capped the Willamette valley as I drove up I5 North to the last beer fest of the season, Portland’s 12th annual Holiday Ale Fest drew me out into Oregon’s cold wet winter with the promise of 41 special Holiday beers. The thought of spending the day tasting beers with names like Bad Santa (Pelican), Brewdolph (Lompoc), Tannen Bomb (Golden Valley), Kringle Krack (Calapooia), and Blitzen (Rock Bottom) had me salivating and driving just a little faster than the law allows. 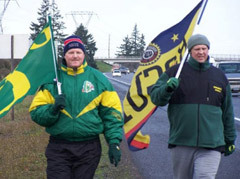 I’d gone about 30 miles when I noticed two men walking down the south-side shoulder of I5, flying a Rogue Ales flag high and proud. Luckily I was coming up on an exit so I was able to swap directions quickly and find out what was up. Dave White and Tim Pyatt are part of the crew making the annual walk from Portland to Eugene to raise awareness for their cause, “The Wounded Warriors Fund.” The group takes the four days leading up to the Oregon football civil war weekend (the annual Oregon State vs. University of Oregon grudge match) to cover the 100 plus miles from Portland to Eugene. They carry two flags, one for their favorite team, the U of O, and the other for one of their biggest supporters, Rogue Ales of Oregon. Since the they began in 2000, the money raised for “The Wounded Warriors Fund” has helped wounded service men and women and their families with travel expenses in their time of need. This is a very worthy cause and I plan to contribute to it myself. If you’d like to support the Wounded Warriors Fund go to www.duckswalk.org for more information. An hour after talking to Tim and Dave I was in the heart of Portland’s downtown. 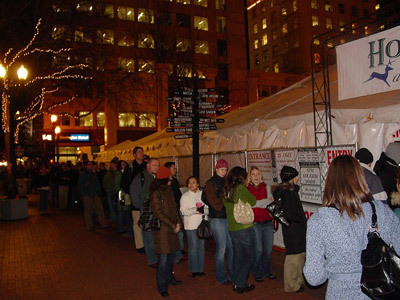 The tents for Holiday Beer Fest filled Pioneer Square as snuggly as a cork in a bottle. With expected crowds topping 15,000 for the three day event I was a little worried I might be experiencing that same feeling once inside. 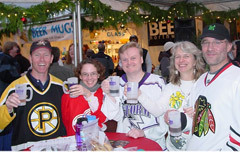 My worries were well founded, Friday night at the Holiday Ales fest was a lesson in patience. The beers were great, but the lines were long and the tents were very crowded. Most of the people were getting a full mug and going directly to the next beer line. The lines typically took over 20 minutes, so I was just finishing the previous beer as I approached the pouring table for my next. These were all big beers. Santa’s Private reserve by Rogue Ales was the lowest in alcohol I saw at 5.3%. Most of those I tried were above 8%, which can make for a bit of a woozy evening. Lagunitas Oaked Brown Shugga, A Strong Ale (9.9% abv) originally a 1997 failed attempt to replicate an Olde Gnarlywine recipe, this beer is deceptively smooth and drinkable. I know a lot of people don’t like the sweetness of this beer but I’m not one of them. The aroma is sweet and malty with some dark fruit and floral hop accents rising from the glass. It produces a nice, well-carbonated, head. The brown sugar is evident in the flavor which is bready malt, dark fruit, and some well balanced hoppiness followed with a dry, robust finish. A delicious beer, that’s done nothing but improve with barrel aging. O’Holy Hops by Max’s Fanno Creek Brewpub, an Imperial IPA (8.5%). Beer writer Lisa Morrison told me she was going for Big Hoppy beers this year (because of the hops crunch) and recommended O’Holy Hops as the best she’d tried so far. That was enough for me to cue up for a plastic mug full. The nose of this beer telegraphs the hop character long before it gets to your face. If you like big hoppy northwest beers this is one you should seek out. The hops were so strong they almost crossed over from bitter to sweet, and it wasn’t very complex, I mean that in a good way. This is a good, honest, Imperial IPA. After an evening of big beers it was nice to dial it back to 5.3% with a full mug of Rogues, Santa’s Private Reserve, a hopped up version of Saint Rogue red with double the hops and a mystery hop called Rudolph. The nose was a nice balance between hops and malt with citrus notes. The taste was strong on hops followed by a mixture of caramel, toast, and kind of a seesaw between chocolate and smoke but not quite either. (I had been thru quite a few beers by now so forgive my failure to pin it down) and a crisp bitter finish. It’s a very nice hoppy “Red Ale” and I’ll recommend it to my Hopheaded friends. 1. JIM II – complex, fruitcake (in a good way) with everything you would expect, this beer is a WOW! My son and I went last year as he was attending the U of O and had just turned 21. I met him in Portland for this event late Saturday. While the setting is very cozy and innovative for a winter fest, it’s Too Damn Crowded. This year he went with friends and reported it was even worse. They should dial back the number of people they let in, re-orient the beer lines in the tent, or *something*! In any case the beers are delightful but the event is a bit of an ordeal. Next time I’ll go on an off-day or not go at all. I have a fair amount of analysis at my blog, Beervana, too. I share Gary’s choice of Jim II and Fa La La La La; add Raccoon Lodge Baltic Porter, Widmer Decorator, and Caldera Cauldron Brew.